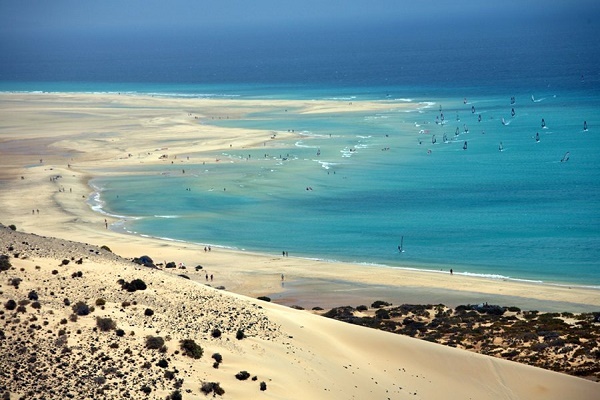 “Playa de Sotavento“, which is 5 km long, is situated on the southern east coast of Fuerteventura. The beach is divided into the sections “Playa Risco del Paso” (the small town is also called Risco del Paso) and “Playa Barca”. On both beach sections there are surf spots by Rene Egli. Every year, windsurfing and kite boarding world championships take place here. Playa de Sotavento is ideal for both surfing and kite boarding beginners and masters. The beach is too windy for relaxed bathing but you can lie down in the protected small dunes that are covered with vegetation. You can also do naturism and the beach is suitable for children since the water is very shallow. However, you have to consider that there are many surfers in the sea. How to get to the beach: On the FV 2, take the exit at KM 72 and follow the road. This road leads directly to the car park of “Playa de Sotavento”. First the road is tarred, the last 200 m is a bumpy gravel road. Parking options: Car park directly at the beach.